It’s time for the last Bingo of 2018!! 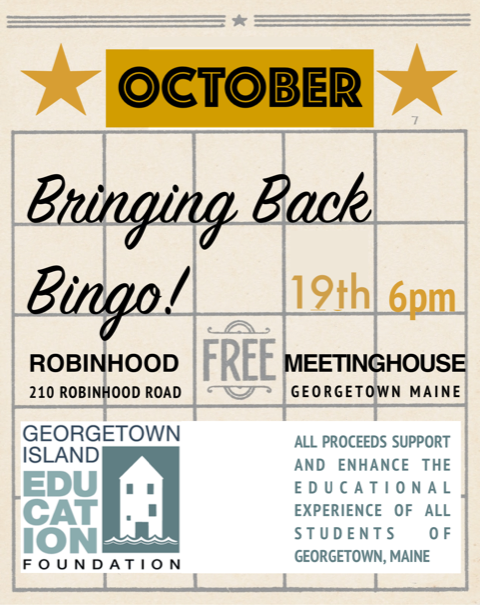 Come out for a fun night of games and donated prizes to support Georgetown’s children. First ticket free! Food, drinks available. Proceeds benefit the Georgetown Island Educational Foundation. About GIEF: The mission of the Georgetown Island Education Foundation is to support and enhance the educational experience of all students of Georgetown, Maine. Throughout the year, ​GIEF funds projects and materials that are not, and would not be expected to be, funded in the regular school budget or through personal funds. GIEF grants create opportunities for students in grades 3-12 to acquire the skills, knowledge and confidence needed to become well-rounded citizens and to develop to the full extent of their potential.